A protest was held last week at the University of Manchester to raise awareness of Israeli Apartheid Week. The week-long series of events is aimed at co-ordinating the activities of BDS (Boycott, Divestment, and Sanctions of Israel) societies across global universities. In addition to the march, awareness of exactly how BDS works will be encouraged, in addition to a visit from Andrew Feinstein, a founding member of the African National Congress and anti-arms activist. The protest centred on American machinery company, that has supplied the Israeli army with special equipment, designed to destroy Palestinian homes. 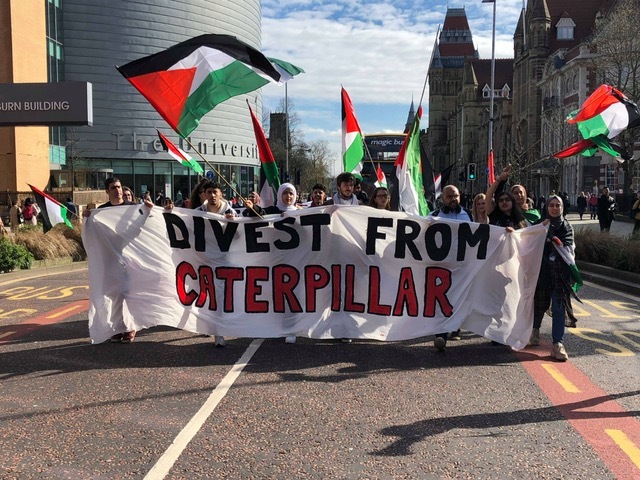 According to BDS, the University’s total investment currently stands at close to £482,400 – they also claim the University holds shares of over £2.3 million in Allianz, a drones supplier. Last month, BDS worked alongside with the People and Planet society to storm a Board of Governors meeting, calling on senior officials to stop investing in harmful practices. BDS have further claimed that the University has neglected its ‘Social Responsibility’ commitment, with research undertaken at the Graphene Institute reportedly linked to the arms industry. The organisation has further highlighted that students may unaware of how their institution’s investments indirectly see the student body become complicit in ethically-questionable practices. The University of Manchester’s BDS chair, Emilia Micunovic emphasised that students should understand exactly how their fees are used. Ben Freeman, the President of Manchester Jewish Society, took a different angle on the week’s proceedings, arguing that an unhealthy discourse on Israeli policy could be encouraged. A University of Manchester spokesperson said: “The investment manager reported back to the University that Caterpillar’s stance continues to be that it does not have the practical ability or the legal right to determine how its products are used after they are sold and that it does not have plans to boycott sales to any country that is not sanctioned by the international community.